The struggle to conceive is one that many couples know too well. For Andy and Sarah Justice, year of infertility brought about the decision to adopt. 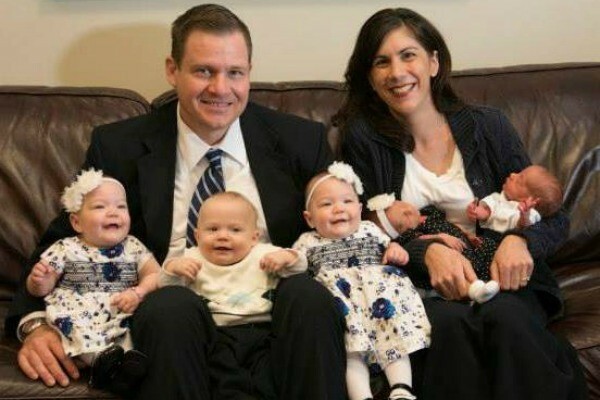 But just one week after welcoming triplets into their world via adoption, Andy and Sarah received the surprise of their lives – they were expecting not one, but two more babies. 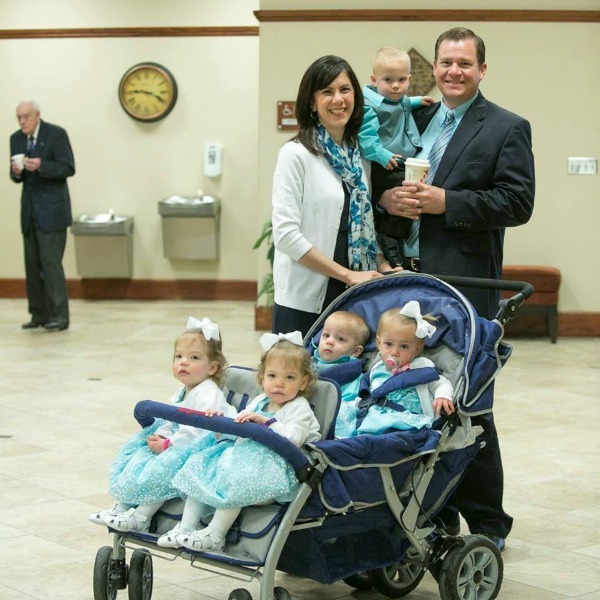 Come and share the surprise and delight with Sarah, Andy, their triplets, Joel, Hannah and Elizabeth and their twins, Andrew and Abigail, born only seven months apart. Imagine the joy of discovering that you are about to become proud parents of a much-longed-for baby. This is exactly how Sarah and Andy felt when a birth mother chose them as her baby’s adoptive parents. When Sarah attended the first ultrasound, doctors revealed the mother was indeed pregnant – with triplets! Sarah and Andy were over the moon, especially as they’d always wanted more than one child, but the adoption process was long and tricky. Triplets meant an instant family with no red tape. “It’s everything we wanted,” Sarah told Tulsa World. The Justice triplets – Joel, Hannah and Elizabeth – were born at 32 weeks and weighed only 1.3 kilograms each. While Sarah and Andy cared for them and visited them in neonatal intensive care, Sarah began to feel nauseous. Doctors confirmed that Sarah was pregnant and another Justice would be joining the clan soon. Then an ultrasound hit them with the news that Sarah was expecting twins. Abigail and Andrew were born just seven months later and the family quickly settled into a routine thanks to the support of their family, friends and community in Tulsa, USA. During those first weeks the family went through 84 bottles and 300 nappies each week and while sleep (and sitting down) is a rare luxury in the household, the couple said they wouldn’t want it any other way. 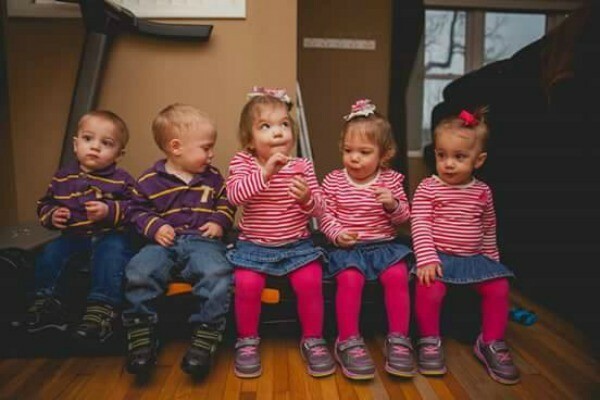 The five little ones are toddlers now and life is a constant juggling act for the busy parents with things about to get even crazier. 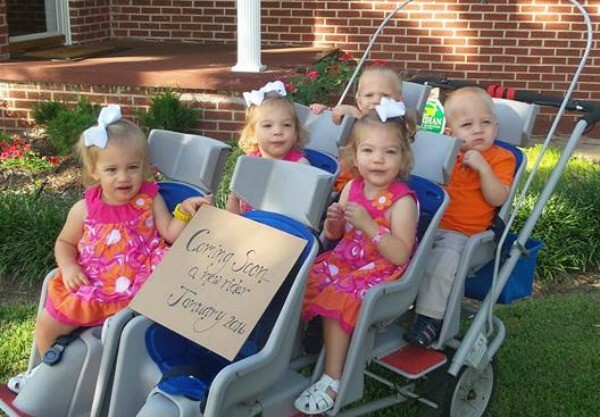 The family of seven is preparing to welcome baby number six into the world in January 2016! A big Babyology congratulations to the Justice family!